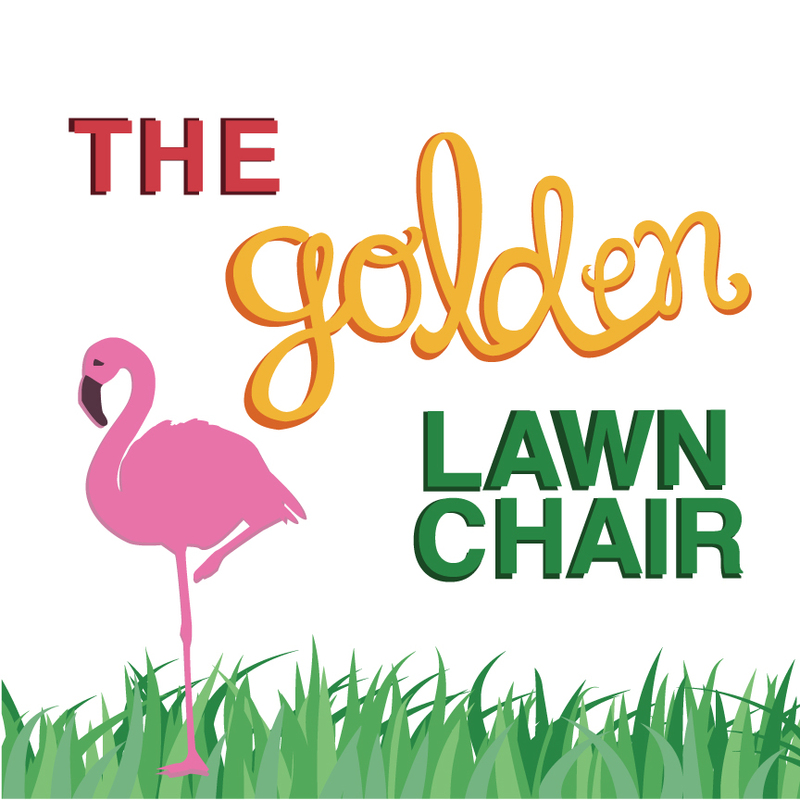 The Golden Lawnchair is back! I know it's been awhile since I posted. I have a good reason, I promise. 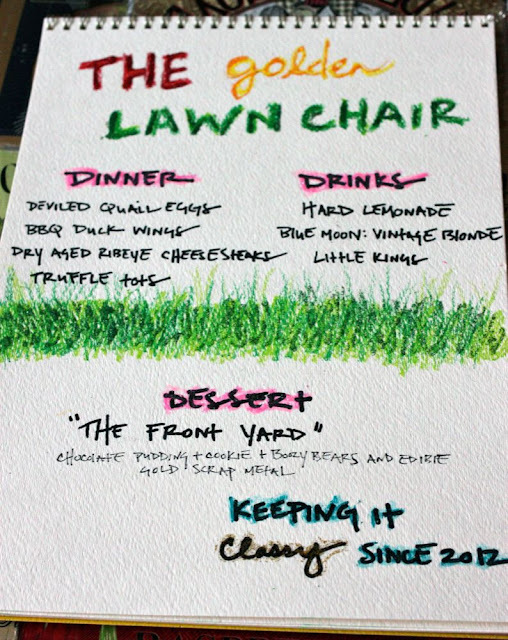 Remember that post about The Golden Lawnchair dinner? Well, it's happening again. Only it's bigger. Much, much bigger. And you've got a chance to come to this one! What have we been up to? A lot. We've partnered with Josh Campbell from Mayberry in OTR to make his restaurant into The Golden Lawnchair for one night only, on November 18th. We've been planning this for about a month, and if you follow me on twitter, you've probably already heard about it. We're keeping the original menu (with some minor adjustments), and adding a ton of other great things, for a great cause. We decided to make this more than just a bigger version of a Welcome Back Dinner, but instead, make it a benefit/fundraiser for the Freestore Foodbank in Cincinnati. We asked the Foodbank what they needed most (canned goods, turkeys, that kind of thing) and they told us what they really needed was simple. Cash donations to support their mission to help neighbors in need this winter. So we figured out how to help them raise funds in as many way possible. First, we decided to sell tickets to the dinner online, and have everything over basic food and operating costs for the restaurant go to the Foodbank. In addition to the tickets, we also offered several perks people can contribute to. They range from a handwritten thank you note from yours truly (super fun to decipher, as my handwriting is notoriously artistic) to a cocktail lesson with Molly Wellmann, to a woodfired pizza lesson at A Tavola. The link to the online campaign is here, full of all the delicious details. Please check it out and donate to help the Foodbank! Dinner sold out in less than two days, but we wanted more people to be able to come join the fun. So we're offering the very last two tickets on ebay. The auction will run until the night before the dinner, and monies raised from it go directly to the Freestore. And that's not all! Following dinner, we are opening up Mayberry to everyone for an afterparty at 9 PM. The $15 cash cover for the afterparty also goes to the Foodbank, and we'll have snacks, drink specials, live music and raffles. What kind of raffles? Well, let's just say the collective value of all of the items we've secured is well over $1500.00. As you'd probably guess, all the money raised from the raffles goes to the Foodbank too. See? As many ways as possible. And we wouldn't have been able to do it alone. I want to take a moment to thank the many local businesses that have donated to the raffle, the many friends and fellow bloggers that have helped me spread the word through Twitter, posts on their own blogs, and Facebook; as well everyone who has listened to me planning this incessantly, Jenny Kessler for designing the menu and kickass logo, and countless others who have supported this venture. As far as I know, a pop-up restaurant as a fundraiser is a first for Cincinnati, and I'm confident it's going to be a great time. So come on down to the Golden Lawnchair and join us in keepin' it classy. “So...what are you making this time?” The cashier at the art store asked as I scooped up the numerous bottles of tempera paint, brushes and gigantic roll of banner paper off the counter. “Well, you see the theme this time is...” I answered, and prepared to explain the slightly eccentric plans for David’s latest welcome back dinner. For new readers, my husband's prior job would take him out of town to Michigan periodically. To welcome him back, I began preparing dinners. While they have all been different, there are two constants: they always have a theme, and that theme is always a surprise. After over a year of making welcome back dinners with various themes and requirements, my usual go-to places for supplies are starting to catch on that I’m usually up to something a little nutty unusual. Over the past year, dinners have gotten more complex, and I’ve started exploring different art mediums for the menus. So if I walk into Plaza artist materials, there’s no telling what I’ll walk out with. Maybe some India ink? Calligraphy pens? Water colors? Oil pastels? Acrylic? A 12' by 5' banner? More paint brushes, since the cat likes to steal them and hide them in the corners of the apartment? Same goes with Avril Bleh. Some of the dishes I have made have required very specific cuts (St. Louis style ribs, cut in half, please), so I received a similar question -- what are you making this time? -- when I headed there next. This time my meat-quest consisted of dry aged strip and ribeye steak, sliced extremely thin. Because how else are you going to make the fanciest philly cheesesteaks ON EARTH? I had the entire day free, but I wanted to take care of the prep early so I could focus on the banner I was planning to paint for the name of the restaurant. Philly cheese steak veggies (onion, pepper, mushroom and a little black truffle) were easy enough to prep, but things went South (sort of) when I tried get all fancy and caramelize the onions. The onion disintegrated into the bacon fat I was using, and I ended up with a small amount of onion-bacon jam instead. While onion-bacon jam is never a “fail,” I did have to start over slicing onions. Once the veggies were prepped, I started on what I figured would be the most daunting task, deviled quail eggs. I bought 24 quail eggs, because I was fully expecting to mess up the first 12. To my surprise, other than the anticipated tedium of trying to peel tiny eggs, they came out perfectly. The dessert, which I dubbed “The Front Yard” was something that required a little forethought. Boozy gummy bears with different combinations of liquors and colors were prepped early in the week, and I hunted all over town for flamingos on pink picks. Cappel's downtown came through in the end. And of course, there was edible gold “scrap metal”. David has a new job now (yay!) that doesn't require him to travel every month, so future welcome back dinners are going to be even trickier to plan and execute. Don't worry, though, I've loved trying my hand at different, challenging dishes, and I don't plan on giving up any time soon. Besides, I haven't even written about when I made him beef wellington yet. Fear not. It won't be long before I'm back at Plaza art supplies, buying who knows what! Not only has he gotten me into an Indian restaurant, he’s actually got me to the point where I will happily pick up take out and bring it home for dinner. You may remember a while ago when I made him an Indian welcome back dinner and nailed it, despite never having eaten at one before. Well, I finally caved and let David take me to Ambar on Ludlow last year, so I could try some of what is arguably the best Indian in the city. I tried the lamb korma and dal makhani, and it was indeed fantastic. I grudgingly admitted to David that I'd been foolish to have held out for so long. And since then, I’ve been stopping by Akash, an Indian restaurant downtown, nearly every other week. I’m slowly trying new things on the menu, and I’ve been pleasantly surprised each time. For instance, why wasn’t I told about paneer pakura — which is basically a deep fried cheese nugget — sooner? I think Akash does most of their business during lunch, because when I pick up my takeout in the evening, it’s always quiet. Service is fast and efficient, and I usually stick with my now favorite dish, the lamb korma. It has tender lamb, a tangy cream sauce, raisins, and my favorite nut, cashews, which I always get ridiculously excited about when I find them in a forkful. David bounces around a little, getting vegetarian dishes, as we also usually get one of their flatbreads. Though the food is always delicious, we have noticed the spice level depends on who is in the kitchen, and now have settled on a “2” on the 1-6 scale to stay on the safe side. We’ve definitely come a long way from when I was hesitant to even set foot in an Indian restaurant. Now David just has to convince me to order something other that the lamb korma! As most of my friends and close acquaintances know, I have a little bit of a cheese problem. While some people can rattle off football or baseball rosters from memory, I have a lineup of what cheeses are available at which local stores. The cheese drawer--dedicated in its entirety to delicious varieties of fromage--overfloweth with wedges. I’ve bought an entire half wheel of cheese from the Party Source, and I don’t regret one penny of the eighty plus dollars I forked over for it. Which brings me to the press release I received a few weeks ago. Many bloggers receive releases and pitches from PR agencies and companies looking for a leg up or some free publicity. In exchange, bloggers are sometimes offered free product to review or giveaway to their readers. I try to stay away from the giveaways, as there are other blogs in Cincinnati that are more into that kind of thing. But the email below caught my attention. Applicable to my interests, clearly written, courteous. And a locally based company to top it all off. This is probably the one of the best pitches soliciting a post I have ever received. I saw on FoodBuzz that you are a Cincinnati blogger (or perhaps mentioned it in some way), and I was wondering if you would like to review our biscuits. We are a Cincinnati based company. Daelia’s Biscuits for Cheese were created to enhance the cheese eating experience, whether the cheese is made locally or imported from around the world. Launched in 2009 at the American Cheese Society Conference in Austin, Daelia’s Biscuits for Cheese is still a new company. We currently offer three biscuits – Almond Raisin, Hazelnut Fig, and Pumpkin Seed Rye. All biscuits are twice baked and made in small batches to guarantee the perfect texture. 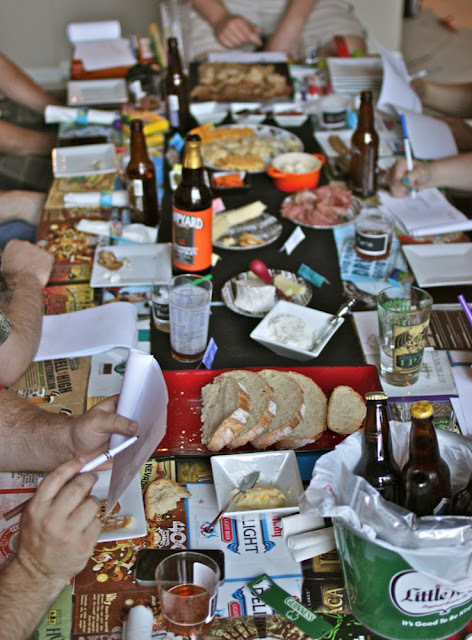 They also contain carefully selected fruits, seeds, and nuts, and pair well with a variety of specialty cheeses. Our biscuits are all natural, high in fiber, low in sodium and crunchy – the perfect addition to any cheese plate. Our biscuits are available in Whole Foods nationwide and various independent cheese shops. They can also be purchased online at www.igourmet.com. Would you like to review our biscuits? We would be happy to send you some samples to review if you are interested in working with us. We would also be willing to offer samples as a giveaway to one of your readers. We only ask that you require readers to follow us on Twitter as an entry in the giveaway. Please encourage them to use our hashtag - #biscuitsforcheese. Also, suggesting that readers like Daelia’s Biscuits for Cheese on Facebook would be nice, just don’t make it a giveaway entry – promoting Facebook in a giveaway is now against Facebook’s Terms of Service. We also encourage creativity in your review! We would love to know what cheeses you would pair with our biscuits with and why. You could also use our biscuits in a unique recipe to give readers other ways to use our biscuits. Feel free to really make this review your own. We would be more than happy to promote your review on our Facebook and Twitter pages (we have over 1,800 Facebook fans!) after it has been posted. If you are interested, please do not hesitate to contact me so we can send samples your way. While I still wasn’t willing to start doing giveaways, I thought that there might be another way to do a post, try out the biscuits, and eat some of my favorite cheeses with good friends. So I decided to throw another cheese party. I also had done some inventory of our beer stash, which has been growing steadily for the past year, and decided that it was time to crack open some of the rarer and more interesting beers we’ve been saving to pair with the cheese and biscuits. I invited several friends, asking them to bring themselves, and their smartphones, and to tweet any thoughts about the biscuits. There were, of course, workbooks, complete with crosswords, coloring pages and wordscrambles. Some of our favorite combinations of cheese and biscuit are below. While I think these should be called crackers instead of biscuits--David was thoroughly confused until I showed him the website--whatever you call them, these are good. The ingredient list is also refreshing; no weird chemicals or preservatives. David also made some bread, which had a fantastic crunchy crust. Everyone seemed partial to the pumpkin and rye biscuits, but David and I cast our vote for hazelnut and fig. Almond and raisins were also good, though they’ve got a little black pepper kick. David and I picked up another package of the hazelnut and fig at Whole Foods the other day, which we are looking forward to opening. The next day after the party, I lined up the damage on the counter, which is impressive.